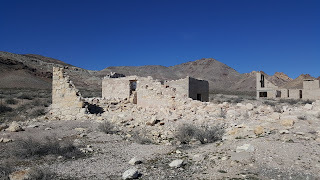 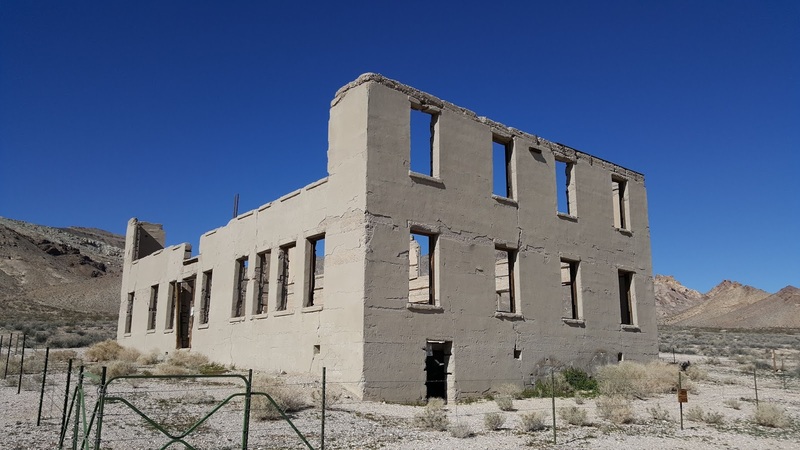 Today we drove 100 miles to Rhyolite near Beatty NV off Hwy 95. 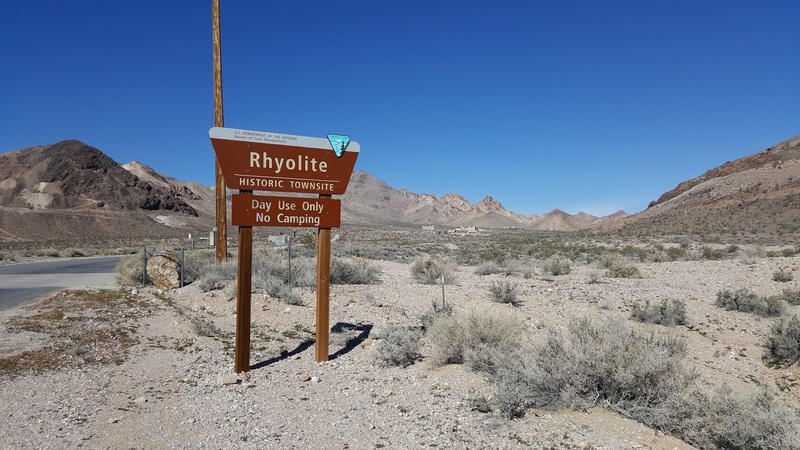 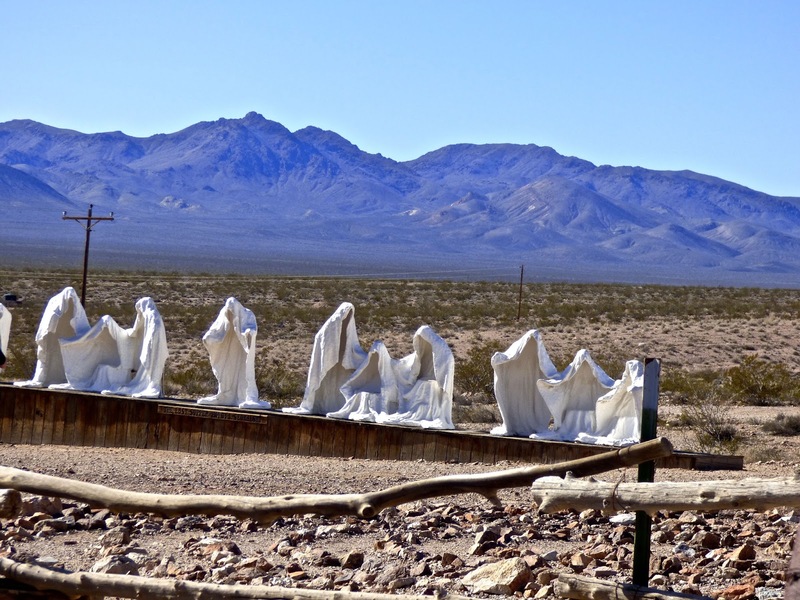 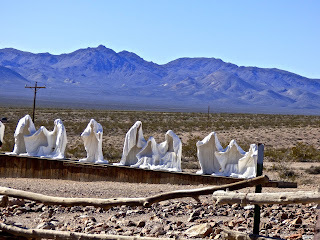 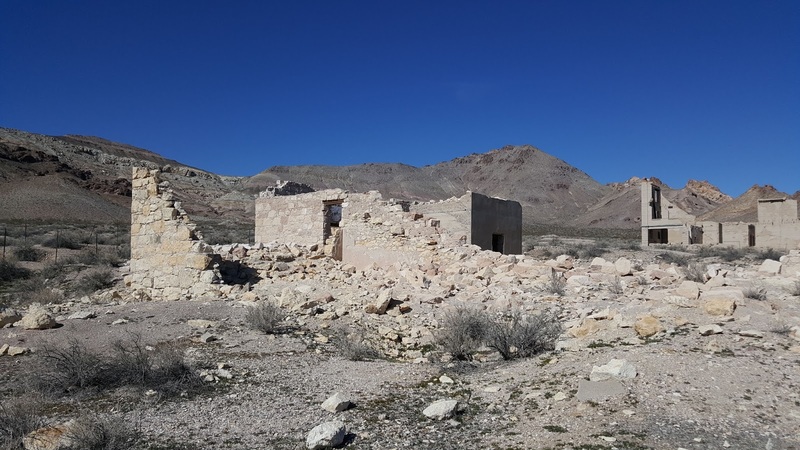 Rhyolite is a ghost town in the Bullfrog Hills near the eastern edge of Death Valley. 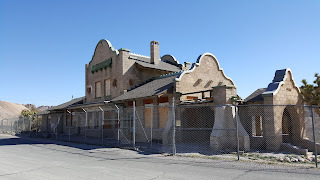 The town sprang up in 1905 after a mining discovery with the biggest producer, the Montgomery Shoshone Mine purchased in 1906 by Charles Schwab. 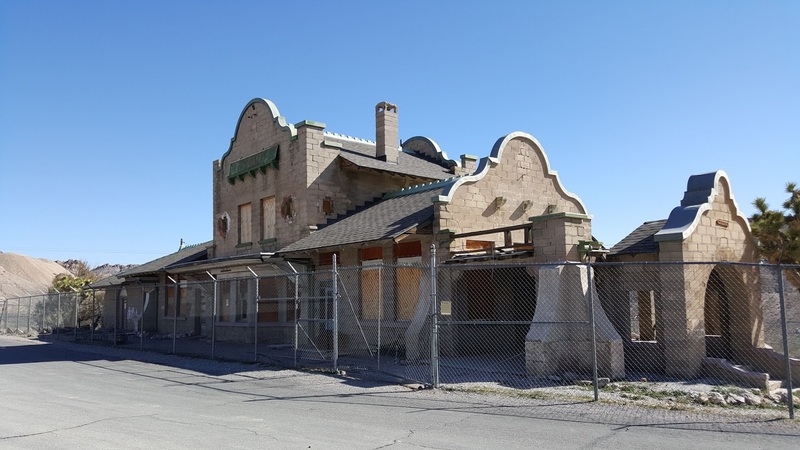 He invested in the infrastructure building a rail line, bringing in water, electricity, hospital,school, opera house, casino,bank and housing. 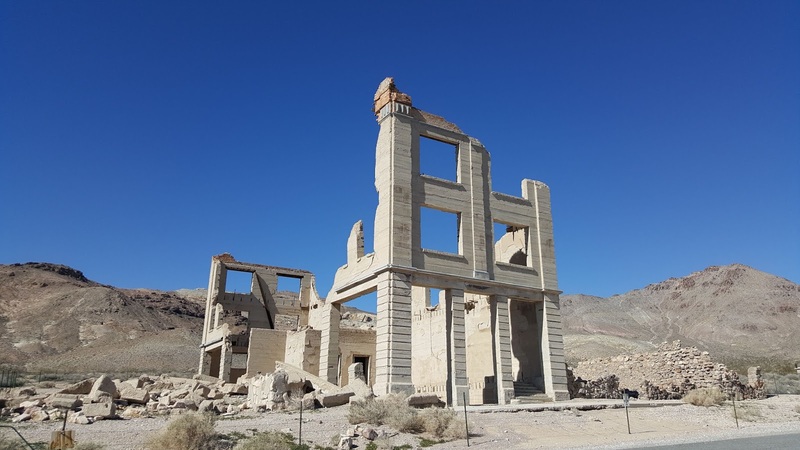 The town declined after the mine was exhausted and the 1906 San Francisco earthquake. 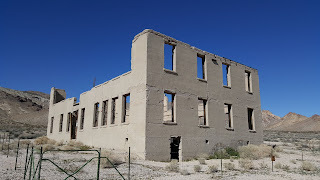 By the end of 1910, the mine was operation at a loss and closed in 1911. 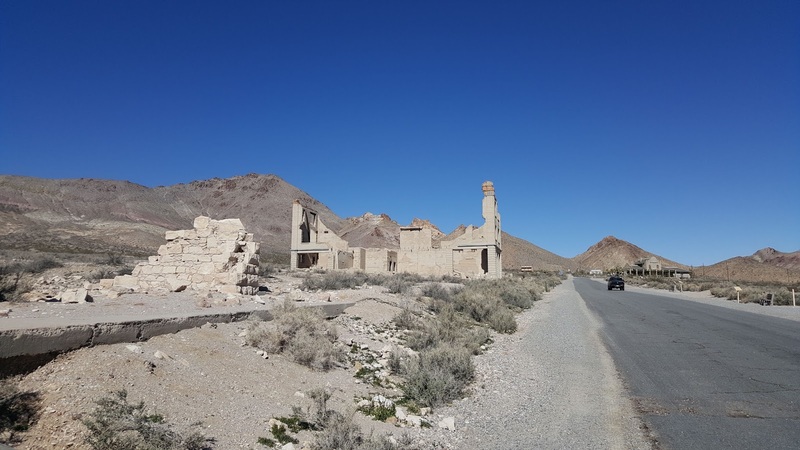 By 1920 the population was near zero. 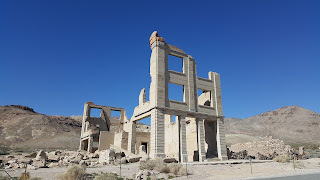 Most of the buildings crumbled. 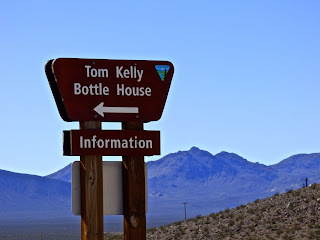 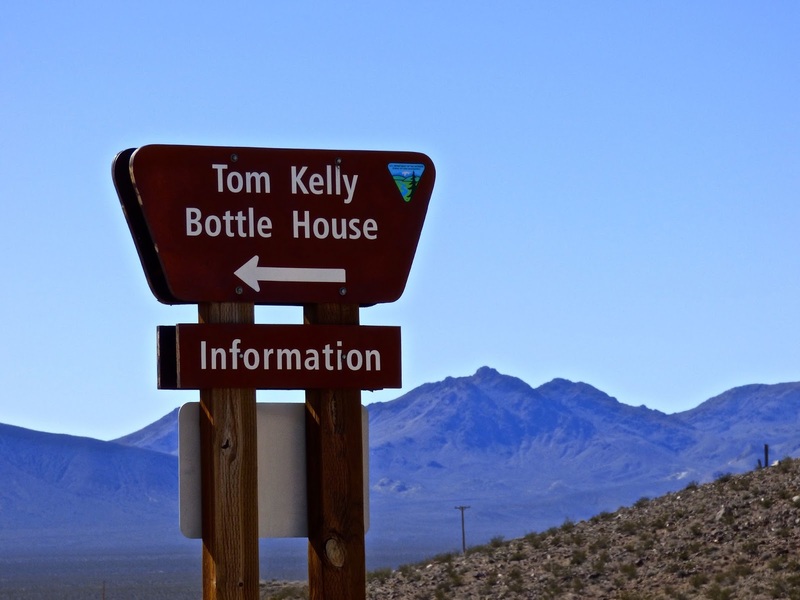 The bottle house was preserved. 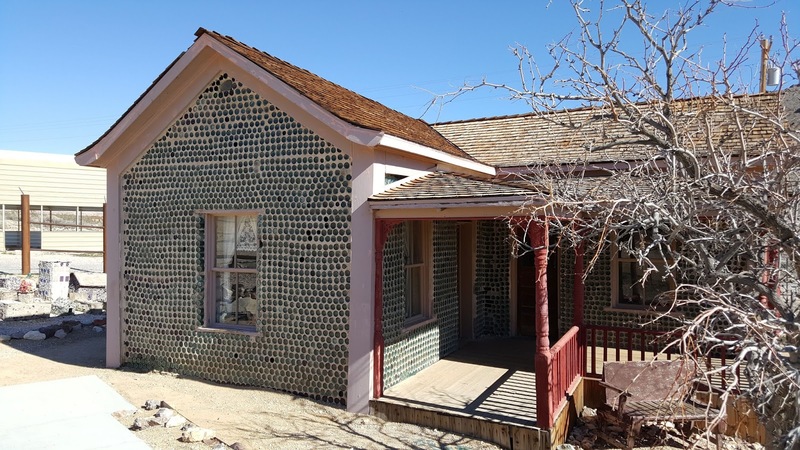 It consisted of over 50,000 bottles. The town was named for an igneous rock composed of colored silicates. 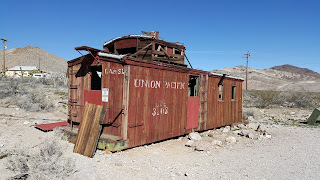 I was somewhat disappointed as the small museum was closed. 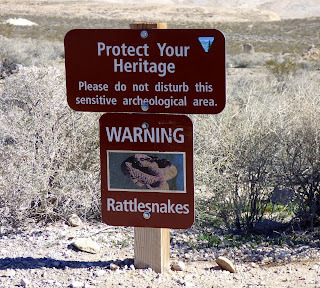 Good thing I took a picnic lunch which we enjoyed before leaving. 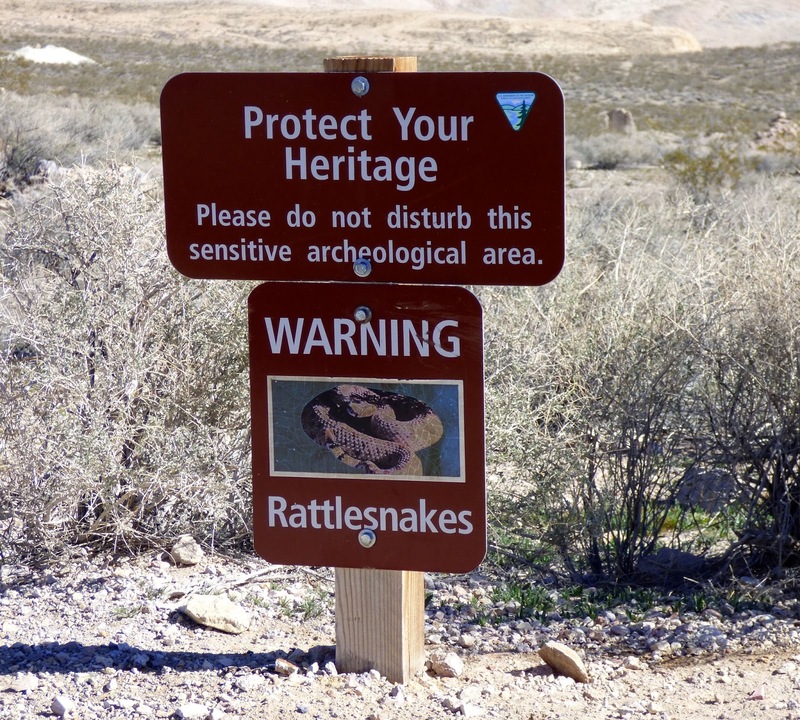 Rattlesnake signs are prevalent, which gave me cause not to hike the area. 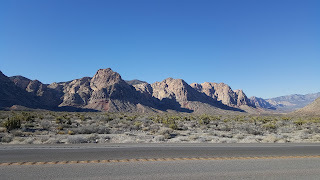 On our way home we decided to take the route back through Pahrump on Hwy 160. 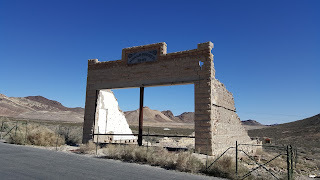 We were quite surprised at how spread out the town is and understand it is noted for the brothels..one in particular called The Chicken Ranch which offers free tours..We passed on this in spite of funny experience our friends Don and Carolyn related on their visit several years ago..only they can tell the story. 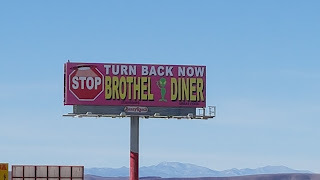 May do that another time. 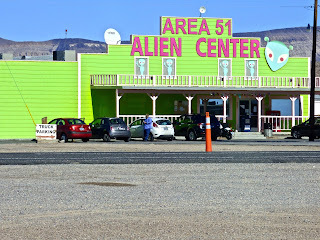 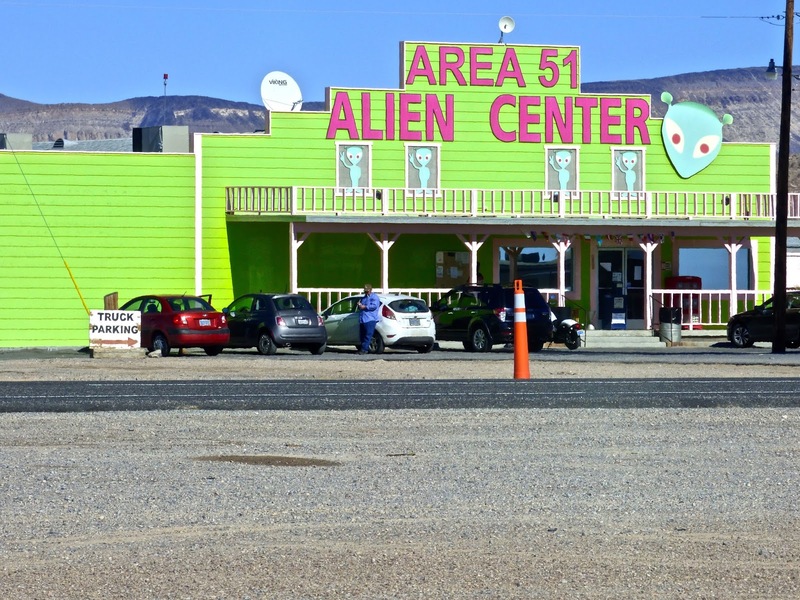 We did stop at Area 51 attraction on Hwy 95 to get gas, which was only $1.99. 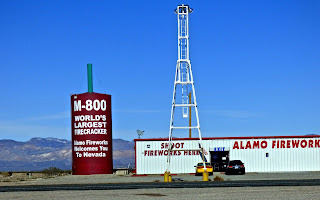 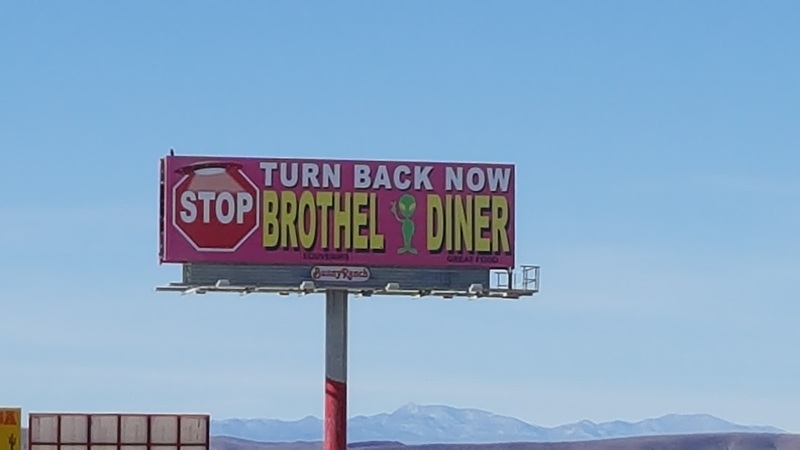 It consists of convenience store, brothel, campground and fireworks dealer.